Starting over is never easy, especially for those who have suffered so much loss. The Syrian refugees we have met over the past two days are bound together by painful cords woven with strands of loss, suffering, and uncertainty. They live in an upside down world where so many things do not make sense. Every day is a struggle to survive — not just by putting food on the table, but by trying to fit the pieces of their shattered lives back into some kind of sensible order. That’s not easy to do in a context where everything is drastically different and the odds are stacked against you. But somehow, those we have met are managing to put one foot in front of the other, painful as it may be, as they inch their way toward an uncertain future. 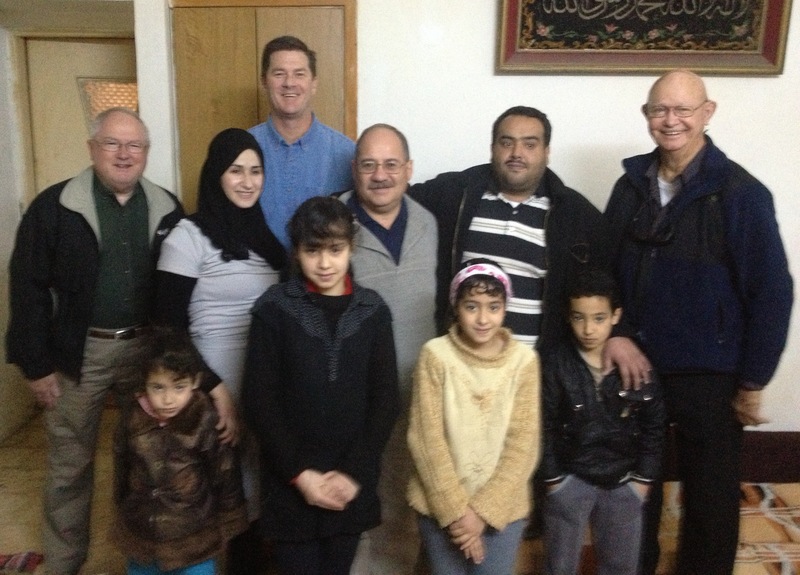 At the end of the day our team worshiped at a small church in East Amman. My friend Bill Crenshaw shared his personal story of the difference that Jesus Christ has made in his life. And then, I talked about Jesus and how He loves and cares for each of us and how He demonstrated that love. Just moments after we started to worship, one of the families that we had visited today walked in through the door. It was the father of four, his wife, and their children. This was their first time to set foot in a Christian church. Moments later, his brother, with whom we had also visited, walked in with his family. They looked our way and acknowledged us with their smiles. We instantly felt the warmth of their gratitude once again. What happened after the service was the best thing of all. The members of this small congregation lived up to the example of Jesus. They embraced each of the visiting family members, took time to speak to them and to look into their eyes and to offer words of encouragement. We lingered for what seemed the longest time, enjoying these precious moments of fellowship with our new friends. I have a strong feeling that this will not be the last time they come to this little church. They know now that they do not have to sail their rough seas alone. They have discovered a fleet willing to sail along with them to make certain that their journey is a safe one. As we parted company I sensed that the world was starting to look a little less upside down and a little more hopeful for our new friends. That alone was worth the travel to Jordan. Please give these brave folk a hug from me. Thanks, Jackie. Still out visiting. Just left one family and off to see another. Meeting needs one home at a time here! Dear Brother Omar: I am convinced that you and your team have discovered the pure essence of Christ, “…a cup of water given in my name…” I know you and your team are tired but pull from that inner strength of the Holy Spirit and continue your meaningful service a few more days. Thanks, Jeff. We just had a heartbreaking visit with a family on 13 living in small rented quarters. They wept and thanked us for our love and concern. We all wept as we prayed for peace to come to Syria. This post made me smile! It’s the best feeling when you invite someone to church and they show up! It really was heartwarming to see these families in worship. Very nice folks. I was so encouraged by how the members of the church loved and encouraged them.